There was a time I didn't know how to ride a motorcycle, but desperately wanted to learn to do so. It was late 1994 or early 1995. I was in the 8th grade. 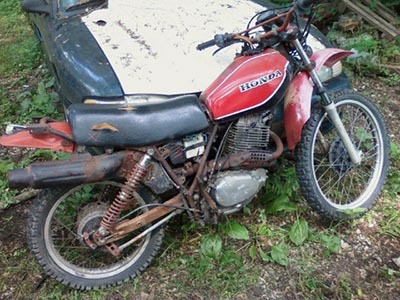 My dad had his old 1971 Honda SL-125 up in my grandparent's garage, and I bugged and harassed him until we finally went over there to pick it up one day and bring it back to the house. Turned out that the engine was locked up solid. Over the next year or so I'd roll/ride it down the hill and try to break it loose by sad attemps at roll starting it/breaking it loose. It never worked out, I pushed that thing back up the hill every time. We eventually began to disassemble that SL-125, but we never split the case of the engine, so to this day it resides with the engine in storage and the frame sitting out behind the house. 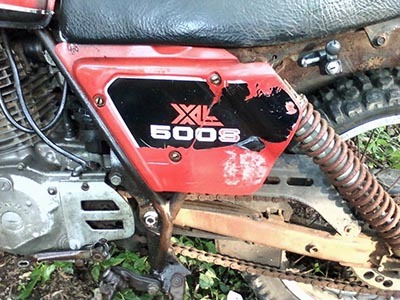 "1980 XL-500." (insert funny voice) "Wotsa power." Dad takes the key, sticks it in the ignition switch on the clocks, and kicks her over a couple of times. Wonderful throaty noises screamed from the Supertrapp. He rolled off and took that great one-lunged thumper around the yard, and rolled back up to me. I must have been beaming at it, because the guy who had it asked ME if I wanted to take it for a lap. Dad asked, "do you know how?" I sort of snorted and said, "Of course!". I had been experimenting/daydreaming about riding that SL-125 for so long. I had learned everything I could about it, even in it's non-functional state. I knew where the clutch was, the front brake, the rear brake pedal, how you shift it, all that. I had been driving farm tractors since at least the 4th grade, so operating a clutch wasn't a total mystery. I hopped on it and rolled around the yard in 1st gear perfectly. I told them I wanted to take it for another lap, and took off again. Apparently that first lap made me an expert, because I gave the throttle a hearty twist. That XL-500, in it's thumper glory, immediately lifted it's front wheel from the ground and proceeded to point the headlight to the skies. In the middle of all this, my feet left the pegs and found themselves dangling near the tail light, trying to get back on, and in the process making it impossible to roll off the throttle due to gravity. Somehow or another, I got that thing back on two wheels just before I reached the front porch of this individual's new looking house and steering clear. I rode it back and parked it, somewhat embarrassed by the impromptu motocross show I had just put on. I don't recall much of what happened next, aside from Dad asking me if I liked it on the way back down to the house with the carpet. I replied something like "it was alright" or something I'm sure. Back at the house, several hours later, I was on the phone with someone, when one of my brothers runs past the door screaming with excitement that Dad has bought a motorcycle. I get off the phone in a hurry and investigate. Outside, dad has pulled up in my grandpa's truck with that XL-500S strapped in. I ask,"Can I ride your motorcycle, Dad?" While stretching out the key to me, he replies, "It's yours." Somehow, we missed the fact that the old loose chain, which I had taken at least one link out of to keep from buying a new one (I was a poor, jobless teen,) was tearing spokes out of the back wheel when it would slip over the sprocket. Eventually, the back wheel became so loose and wobbly that the bike was unrideable. I took the back wheel off with intent of saving money, pop cans, whatever it took to get it relaced. Thing is, I had my drivers' license and the bike became less of a priority, especially since it wasn't street worthy (it was setup as dirt-only when we got it.) That was in 1999. It has been rotting away ever since. As you can see, I had given the old XL little thought since parking it, I had mostly given up even by 2000 because parts were so difficult to find for the bike, and I needed lots of back-end components. I started it while it was sitting on a block several times to keep it going, but eventually, I gave up doing that as well. So there it sits. One of my many other brothers recently came across an '81 XL-500S. I managed to get him to part with it for the same price he paid, $50. It appears to have been wrecked badly, possibly repeatedly. 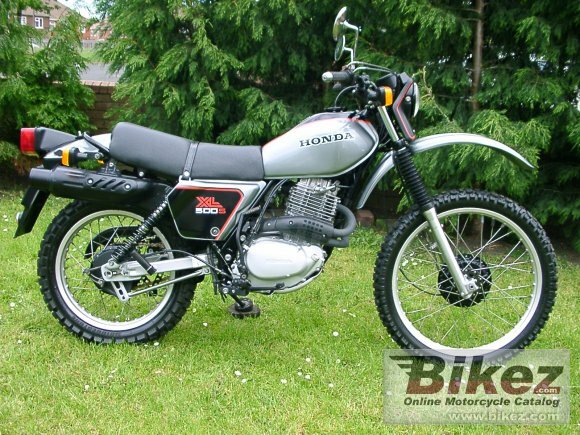 The front forks are bent, the handlebars are bent, the throttle sticks, the compression release isn't assembled right, it pukes oil everywhere (because of the comp release being messed up), it's missing the right side cover, and it has various other cosmetic flaws. The good stuff, you ask? It does run smoothly and doesn't smoke, The gears shift well, and it starts easily. Also, all it's problems are in the front area, the forks and control. The back 2/3 of the whole bike is in decent, even great condition. 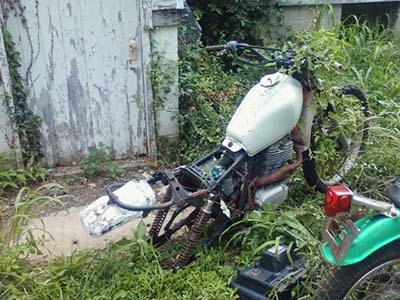 Which means I have one bike with a trashed rear end, and one with a trashed front end. Essentially, I have one good bike between the two. I've got one sidecover, but not the other. If anyone has a spare right sidecover they'd like to donate (or sell, haha), please contact me! Keep your eye out for my future articles, as I hope to document the restoration process as I go. Stay tuned!